At this moment, I´m somewhere in the middle of Spain’s meseta, a vast area of gently rolling farmland, in varied shades of yellow, gold, green and brown. 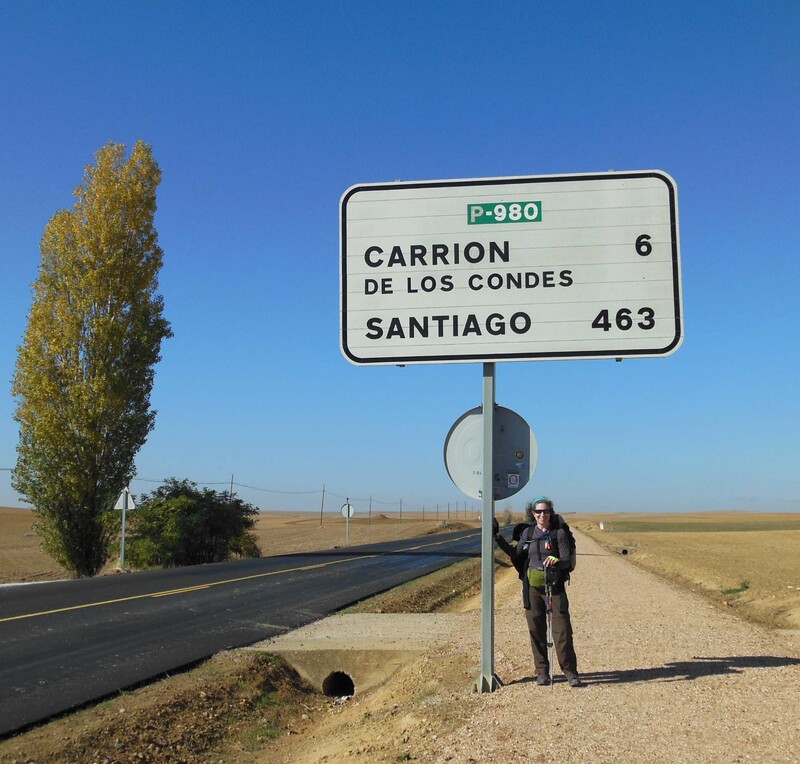 Compared to the first and final thirds of the Camino, it is relatively flat. For some, the lack of ups and downs is boring, a section worth skipping (the bus ride across is only a few hours). But, for those of us who are doing the whole enchilada, the muted palette is soothing to the eyes and the straight paths are easier on the body. By now, most people have developed a bit of a limp, at least for part of the day, depending on whether the muscles are warm or not. Yesterday morning I stopped at a bar (in Spain, bars serve coffee, tea, snacks) for a decaf cafe con leche. A group of Pilgrims had just left and for a few moments I was alone. Then a tall thin guy entered with a pronounced limp. I had seen him on the trail the day before when, after going at a good clip for a few hours, I stopped to take a break and joined him and two others for an impromptu picnic on a hillside. He was from Northern Italy and, on his second day, had walked a whopping 50km (30 miles). Then, he had several days of walking 40km (24 miles). Eventually, his body said: Basta! Enough. “Can I sit here?” he asked as he approached the table. “Sure,” I said. He dropped his pack and ordered something from the bar. He returned with a sandwich, filled with a fried egg and a few kinds of meat. “English breakfast,” he said. It must have packed a few thousand calories. I looked at him more closely. Pale with delicate features and reddish brown hair, he was a gangly version of the Little Prince, but with a backpack. No wonder he could walk 30 miles in a day. He took a bite of his sandwich. I went to use the restroom and when I returned, he had already devoured it. We left together. I warned him I was slow, that the day before I had gone a bit too fast. Moving briskly felt great at the time but I could tell that if I weren´t careful, the shin splints would return. Already, the muscles in my left leg were tight, causing me to limp. “I am going slow, too,” he said. “Today I am recovering.” For him walking 20km (12 miles) was a rest day. He was quiet, his presence unobtrusive, unlike some other characters I’ve encountered. We hobbled from village to village. It turned out that we both live at nearly the same altitude and we each discovered that hiking in the mountains did not prepare us for the Camino. Sometime after 3pm we arrived to our destination for the day, Carrion de los Condes. At the town´s entrance, we checked our guidebooks for lodging information. To our left was a sign for the Convent of Santa Clara which was the smallest of three albergues. It was also the closest. “Let´s go there,” I said, my legs ready to collapse. The brusque hospitalero, with close cropped black hair and a tight blue sweater, looked at us over his spectacles and gave us the run down. For a few milliseconds my American brain fixated on our age difference (I was old enough to be his mother), as if that was a reason to decline. But my weary body liked the idea of not being in a room with possibly dozens of people and turning the lights off early, giving myself the rest I still needed. “Sure.” I decide to roll with it. If I couldn’t loosen some of my useless cultural conditioning on the Camino, where could I? “Credencials and passports, please.” The hospitalero waved us into the reception area. We each took out our Pilgrim credential (a document that allows one to stay at these albergues) and documents. The hospitalero inked a seal in purple and stamped our credencials with the location, filling in the date with a pen. “Do you snore?” I asked my friend, in a moment of doubt. We followed him through the stone courtyard into a chilly hallway. “Blankets in this closet.” He pointed to an ancient wood door. We walked up a cool stairwell and he opened another wood door. The room was cell-like, floors and walls of tile, the ceiling just a few centimeters higher than my friend´s head. A small window opened near the ceiling. A small image of Mary cradling a bloodied Jesus was taped on the tile over each twin bed. Was that supposed to help me sleep better? We laid our sleeping bags over the thin mustard colored bedspreads, emptied our packs, put the paper sheets aside. “What time do you think you want to go to bed?” I asked. Neither of us lasted that long. Many elements figure in making a commitment such as the one you’ve made. Commitments vary, I suppose, because of the availability of time, money, and level of desire. It’s interesting to hear that the path can be divided roughly into thirds, the middle third being boring to some. This is not unlike many books, where the excitement of the beginning introduces us to plot, characters, and setting, and the end reveals the climax and ties up loose ends. Some refer to the middle portion of stories as “the Sahara.” But if the book is well crafted, this portion is where the reader discovers the mettle of its characters. I’m drawn to what you say about some who opt for a bus ride to sort of skip over the “Sahara” part of the journey. Perhaps one day these pilgrims will return with the understanding that they missed the most important part of the Way. One could also say that there is the “Sahara” in writing a book, or in any long term project! Still, for some, the decision to skip this section is due to injury, or lack of time; sometimes the two go hand in hand. I have been browsing online more than three hours today, yet I never found any fascinating article like yours. It is pretty worth enough for me. Personally, if all web owners and bloggers made good content as you probably did, the internet will probably be a lot more helpful than ever before.